An unkempt man armed with a chainsaw wounded 5 people Monday at an office building in the northern Swiss city of Schaffhausen and then fled, police said. A manhunt was on for him. 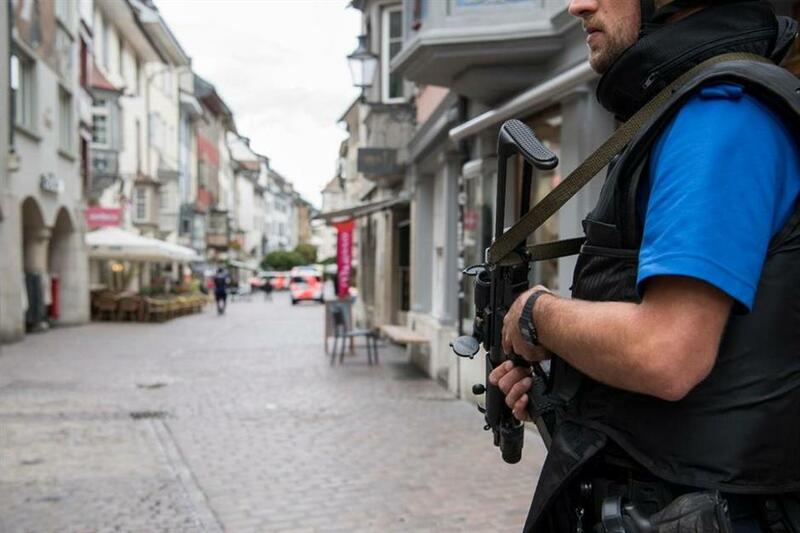 The police shut down the old town of Schaffhausen in Switzerland, while they search for an unknown man who attacked people, on Monday, July 24, 2017. Swiss police say five people have been hospitalized, two of them with serious injuries, following the apparent attack in the northern city of Schaffhausen. An unkempt man armed with a chainsaw wounded five people Monday at an office building in the northern Swiss city of Schaffhausen and then fled, police said. A manhunt was on for him. Police were alerted to the attack at 10:39 a.m. (0839 GMT). Five people were taken to the hospital, two of them with serious injuries, police said. Police warned "the suspect is dangerous" but added "this case is not a terrorist act." They said it wasn't clear whether he still had the chainsaw. A rescue helicopter was brought in to help the victims and the old town in Schaffhausen was sealed off. By Monday afternoon, Swiss police had identified the suspect, whom they described as being about 1 meter 90 centimeters tall (6.2 feet) with a bald head and an unkempt appearance. They did not name him. The man was believed to be driving a white Volkswagen minivan with registration plates from the southeastern Swiss canton (state) of Graubuenden. A health insurance company that has an office in the Schaffhausen building where the attack took place said two of its employees had to be taken to a hospital, the Swiss daily Blick reported. CSS spokeswoman Christina Wettstein told Blick the two were undergoing medical operations after the attack Monday and she doesn't know how they are doing. She said it's not clear who the other three wounded people are and said the company is checking to see if they are customers. Schaffhausen is a city of about 36,000 people north of Zurich, near the border with Germany.